BEIJING - The Chinese government considers the radical remarks made by netizens to be prods toward the adoption of wise foreign policies, says a top political adviser. "When learning about people's opinions, we should take a comprehensive view. The radical comments made by some netizens are just part of the whole," Zhao Qizheng, spokesman for the Fourth Session of the 11th National Committee of the Chinese People's Political Consultative Conference (CPPCC), said in an exclusive interview with China Daily on the sidelines of the session. The voices of the roughly 450 million Internet users in China have taken on an important role in crafting foreign policies and similar matters. A report issued by the State Council Information Office last year showed that there were more than 1 million online forums and about 220 million bloggers in China by June 2010, while Chinese computer users posted more than 3 million comments a day in cyber space. In 2005, more than 100 million Chinese netizens grew outraged by Japanese interpretations of certain events in history and signed on to websites to protest Japan's attempt to become a permanent member of the United Nations Security Council. The mass movement exercised a large influence over Beijing's decision to object to Tokyo's proposal. Meanwhile, ultra-nationalist views have broken out from time to time. The target of many of them has been Japan, which has disputes with China over both territory and historical interpretations. "Such remarks should be taken into account by the government," said Zhao, head of the foreign affairs committee of the CPPCC National Committee. "But the administration should be mature, capable and experienced, and not be easily influenced by radical comments." Zhao said the government is not only closely following the comments of netizens, who are mostly young, but also those of older people. "We have many research institutions and many civilian organizations," Zhao said. 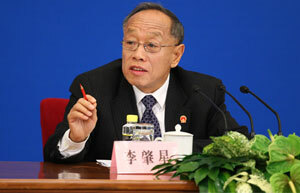 The government, in turn, informs the people of its thoughts through news conferences, speeches and statements, Zhao said. "It should be a dialogue," he said. "Without a general will, a nation will not be strong." 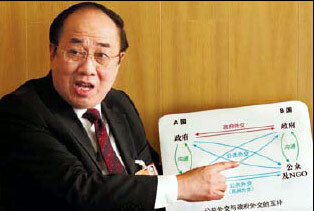 As for the radical remarks made by young netizens, Zhao sees them as being typical of people of that age. The Chinese people have a long history of taking an interest in diplomatic incidents, and the Internet gives them a means of expressing their opinions, said Han Fangming, deputy director of the foreign affairs committee of the CPPCC National Committee. "But now, more often than not, ultra-nationalist comments are hampering the government's foreign policies and affecting China's relations with other countries, especially with neighbors," he said. "Sometimes such remarks become an excuse for countries to spread the notion that there is a 'China threat'." As a remedy, the scholar suggested that more Chinese take advantage of exchange programs to go abroad, learn about foreign countries and gain nuance for their opinions.